I was reviewing some old notes regarding what I call the Time vs. Money See-Saw. Over the years I have had many discussions with clients about our never-ending pursuit of having more money and more time. For many of us, finding just the right balance between having enough time and enough money feels nearly impossible. If we have free time, we often find ourselves looking for more money. Think of all those now out of work and desperate to find a job. Suddenly your work hours are reduced, or even eliminated, and you have ample time to do all those things you’d dreamed about while working like a dog! On the other hand, those who have plenty of money are constantly seeking ways to have more time to do what they enjoy. I know many clients, friends, and colleagues who earn high six-figure incomes, yet they constantly seek ways to simplify their lives and enjoy more free time. If you are self-employed, commission-based, or just simply a workaholic (I am all 3 of these! ), you may find yourself working late at night or on the weekends rather than forcing yourself to enjoy some free time. More Freedom: What I have come to realize through my own journey and exploration is we don’t necessarily want more time or more money; often what we really desire deep down is more freedom with both. This means less stress and more freedom with time and money to do what we enjoy and pursue our passions. If we suddenly accept the fact that we cannot create more time, we can then begin to focus on better managing the time we have. I call this Priority Management. We all have 24 hours in the day, and 168 hours each week, to decide how we spend our time. Similarly, most people cannot run out and suddenly create more money. Now, I will never be one to stand on a pedestal and tell you to stop trying to make more money! But we do have the ability to create more freedom with our money by prioritizing our spending and aligning it with what is most important. In reality, most of us do not have a problem earning money…our financial stresses come from the choices we make once that money hits our bank account! 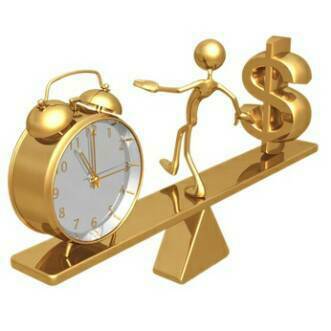 So, I am sure you are wondering what happens if you eventually find yourself with both time and money? You look for fulfillment! And that, my friends, is for future blog posts! This entry was posted in Balance, Freedom, Fulfillment, Money, Time. Bookmark the permalink.